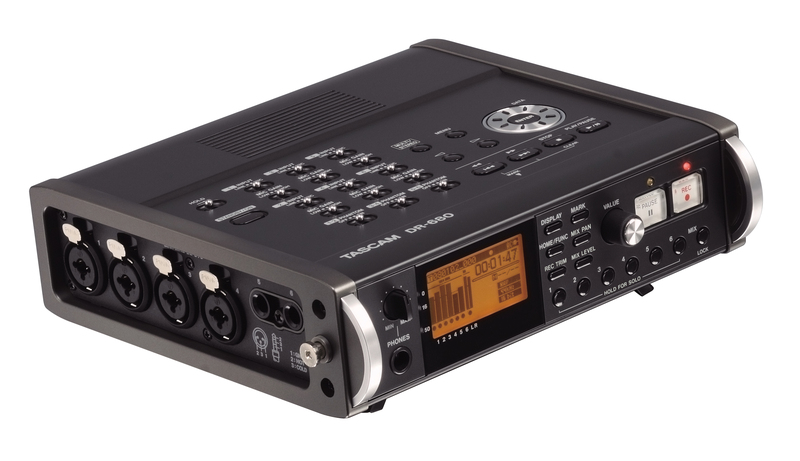 Welcome to my review of the Tascam DR-680 multi-channel recorder. Click on any of the images to view them in higher resolution. I bought the Tascam DR-680 in April of 2010 to replace an Oade Brothers modified ACM Marantz PMD671. 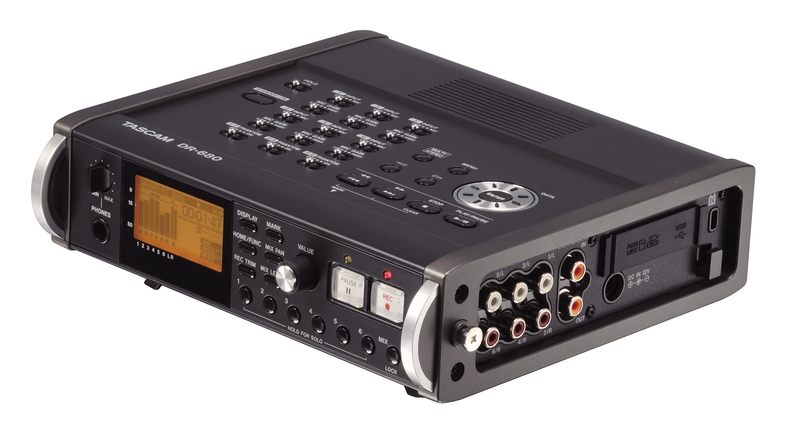 I really liked the PMD671, but it was only a stereo recorder and I wanted to start doing more multi-channel recordings. The DR-680 with its 6 analog inputs, plus a coaxial digital input allows me to record up to eight word clock synchronized tracks at the same time. Right out of the box I liked the way it looked and was happy to see it wasn't much bigger than the PMD671. Smaller is better when buying and using field recording equipment. At first I was bothered by the way recording levels had to be set. On the Marantz recorder (and nearly every other recorder I've owned) there are physical knobs to set levels on each individual channel. Two channel recorders have just one stereo control to set levels. The level setting on the DR-680 is done by watching an LCD screen and using individual buttons to select the track(s) you want to adjust, and a single value controller knob on the front of the unit to make the adjustments. This means you can't simply twist a knob that corresponds with the channel you want to change without having to select it with a button and use the value knob to control it. But, as I soon learned, the reality is that it's really not very difficult to do. It does take some skill to do it quickly, but it's not a big deal. The microphone pre-amps are not bad on the stock unit. They can take concert level signals from typical condenser microphones without having to engage a pad to prevent brick-walling. The pre-amps aren't as clean as the best recorders out there, but they sound fine to me for recording live music in noisy clubs. I'd call the microphone pre-amps on the DR-680 bright and detailed rather than dark or colored. I had an issue with the first DR-680 I got. It started giving me an error code, and it wouldn't record after I started using a non-standard battery plugged into the external power jack. That unit went back to Teac/Tascam and was replaced under warranty. A Tascam repair technician told me the motherboard was bad. I also had a minor power supply related problem with the unit that replaced the first one. I sent that one back to Tascam. They checked it out and said it was working to spec. The problem I was having was again most likely related to the DVD style 9v battery I was using to power it in the field. So, I went out and bought a 12v sealed lead acid battery and have had no issues since. I would suggest to anyone who buys this recorder to always use the included power supply or find a really solid, clean 12v power supply to power it in the field. If you want to read more details about what tapers have to say about it and lots of discussion about the battery issues go here for some in-depth reading: http://taperssection.com/index.php?topic=131128.0. Even after experiencing the issues I had early on, I still really like this recorder. After I started powering it properly I have had no more problems with it. It allows me to record enough tracks for my purposes, it isn't very large, and it isn't very expensive. It records onto cheap and easily available SD/SDHC cards up to 192kHz/24-bit (stereo) and 96kHz/24-bit (multi-track) WAV resolution. With the latest firmware you can gang channels together to quickly and easily adjust the volume of those channels in .5 db steps all at the same time using the front panel value knob. The front and top panels are designed so the buttons, knobs and switches are easily accessed when they need to be used. When I carry the recorder in a padded camera bag with the front of the recorder facing upwards the top switches sometimes move. So, I have to check them each time after transporting the unit. Because it has 6 analog inputs, I made a custom set of cables for it. (Photo on the left) I used Techflex to bundle four 17 foot long XLR to XLR microphone snake cables together, and two 15 foot long XLR to TRS cables together, to make set-up and packing the cables away faster and easier in the field. I'm also using a 12v sealed lead acid battery plugged into the external power jack to supplement the 8 AA batteries installed in the battery tray on the bottom of the recorder. I can record more than 9 hours with this set-up without switching batteries. This comes in handy at festival style concert events. 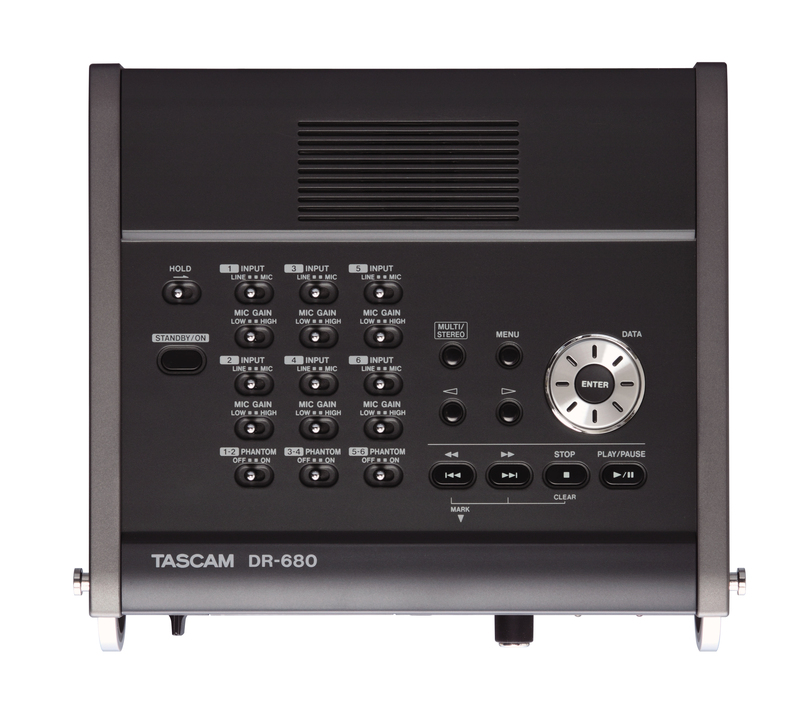 You can see the full specifications, download firmware, download or read the user manual and see reviews and more pictures at the official Tascam DR-680 web site: http://tascam.com/product/dr-680/.